Aubin Cazals traveled from Malta all the way to Las Vegas for the 2012 World Series of Poker, and, thanks to winning Event 6: $5,000 No-Limit Hold'em Mixed-Max, he's not going to leave empty handed. Cazals finished Day 1 with an average stack of 63,600 chips. On Day 2, he finished fifth in chips with 340,000, making him the No. 5 seed heading into heads-up play. 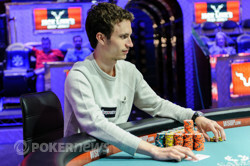 His first opponent was Eric Froehlich, who finished fourth in last year's $25,000 heads-up event. Cazals finished off E-Fro in less than two levels however - Froehlich moved all in with middle pair on a king-high flop, and Cazals held ace-king. The Frenchman held, and was off to the round of 16 to face Toby Lewis. Cazals began with a slight chip advantage, and never looked back. In the end, on a board of , Cazals moved all in, and Lewis called, putting his tournament life on the line. Cazals tabled for aces and queens, and Lewis mucked his hand. 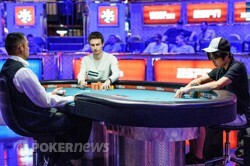 Adam Geyer was Cazal's third heads-up opponent, and Geyer took an early lead in the match. Cazals battled back however, and then the two played a massive pot in which Cazals had two kings and Geyer had ace-king. Cazals' kings held, crippling Geyer, and he eliminated him a few hands later. In the semi-finals, Cazals battled Warwick Mirzikinian for over nine hours. Yes, you read that correctly. Over nine hours. The chip lead changed hands several times, until Level 26, where Mirzikinian was all in preflop with . Cazals' held, and his next opponent was 2010 November Niner Joseph Cheong. The problem is, nobody knew when they were going to play. Initially, they decided to play on Tuesday, but the tournament staff informed them that they must play today. The two then agreed to play at 9 a.m. - which would've been the earliest final table in WSOP history - but Cheong busted from Event 9: $1,500 No-Limit Hold'em Re-Entry, and they rescheduled to noon. Today's match looked like it was going to be another marathon - both players were trading blows, and no one jumped out to a substantial lead. Finally, towards the end of Level 24, the fireworks went off. Cheong six-bet shoved for nearly 3 million chips, and Cazals snapped it off, holding two kings. Cheong's fours were crushed, and did not improve. Congratulations to Mr. Aubin Cazals for winning Event 6, earning him a shiny new bracelet and nearly half a million dollars. Thanks for sticking with us here at PokerNews.com. Until next time, good night from Las Vegas! Joseph Cheong - Eliminated in 2nd Place. Joseph Cheong had the button, and opened to 50,000. Aubin Cazals three-bet to 130,000, and Cheong put in the second four-bet of the match, making it 350,000. 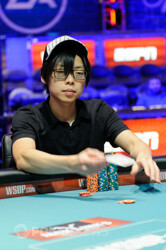 Cazals responded with the first five-bet of the match, re-raising to 730,000, and Cheong moved all in for 2,936,000. Cazals nodded, checked his cards one more time, and called. The flop gave Cazals a set of kings, but Cheong could still make a straight with a running five and six. The on the turn was all she wrote though, and a meaningless fell on the river. It took the tournament staff around three minutes to verify that Cazals had Cheong covered, and once they did, the spectators gave the competitors a round of applause. Cheong fell short of the gold, but he'll take home $296,956 for his efforts. Aubin Cazals opened to 50,000 with the button, Joseph Cheong called, and the dealer fanned . Cheong check-called 60,000 from Cazals, and the turned. Both players knuckled. The completed the board, and Cheong led out for 150,000. Cazals released, and Cheong raked in the pot. Aubin Cazals opened to 50,000 with the button, Joseph Cheong defended his big blind, and the flop fell . Cheong check-called 50,000 from Cazals, and the turn was the . Cheong check-called another 125,000, and the completed the board. Both players checked, and Cheong tabled for effectively eight-high. Cazals showed down for jack-high, counterfeiting Cheong, and winning the pot. Aubin Cazals opened to 50,000 with the button, Joseph Cheong three-bet to 160,000, and Cazals called. The flop fell , and both players checked. The turn was another jack - the - and Cheong checked again. Cazals tossed out 190,000, and Cheong folded. Joseph Cheong had the button, and opened to 50,000. Aubin Cazals called, and the flop fell . Both players checked. Cazals led out for 65,000 after the turned, Cheong called, and the completed the board. Both players checked again. Cheong tabled for ace-high, and was shipped the pot. Joseph Cheong opened to 50,000 with the button, and Aubin Cazals three-bet to 140,000. Cheong four-bet to 345,000, and Cazals released. 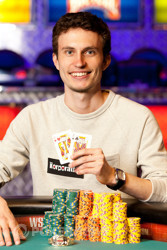 Aubin Cazals wins back-to-back hands with king-ten. Joseph Cheong had the button, and opened to 50,000. Aubin Cazals defended, and the flop fell . Both players checked. The two checked after the turned as well, and the completed the board. Cazals checked, Cheong tossed out 20,000, and Cazals paused to think. "I'll make a loose call," he said, tossing in four orange T5,000 chips, and showing . The next hand, Cazals opened to 50,000 with the button. Cheong defended, and the flop was . Cheong check-called 60,000 from Cazals, and the turn was the . Cheong checked, Cazals fired 125,000, and Cheong called. The completed the board, and both players checked. Cazals showed , and won the pot. 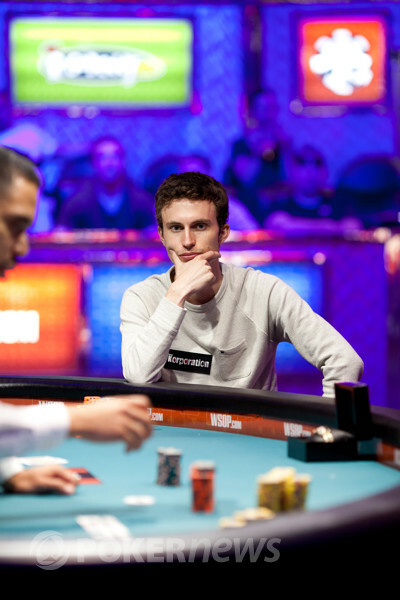 Match 2: Hugo Lemaire Eliminated in 4th Place ($162,443); Joseph Cheong Headed to the Finals!